What It’s About: Something is destroying Japanese subs searching for the remains of Mechagodzilla (after the robot’s destruction at the hands of Godzilla in Godzilla vs. the Cosmic Monster). Marine biologist Akira Ichinose (Katsuhiko Sasaki) believes that it could be Titanosaurus, an underwater dinosaur that Dr. Shinzo Mafune (Akihiko Hirata) claimed to have discovered. This claim-along with his theories of controlling sea life remotely to aid in aquaculture-resulted in Mafune being laughed out of academia. Ichinose seeks out Mafune, instead meeting his beautiful daughter Katsura (Tomoko Ai), who claims Mafune is dead and his notes destroyed. What is Mafune and his daughter’s connection to Mechagodzilla and the aliens who control it, and will Ichinose be able to figure it out before it’s too late? Why Watch it Today? : Akihiko Hirata, who was a regular in the Godzilla series, appearing in the first film as the iconic Dr. Serizawa, died on this date in 1984. His death of lung cancer occurred before his planned scenes in 1984’s Gojira could be filmed, making Terror of Mechagodzillahis last appearance in the series. Today’s movie was also original director Ishiro Honda’s last film, so its somber mood and tragic story, aided greatly by Akira Ifukube’s score, are a fitting send off to the Showa series and two of the men who made the series what it was. 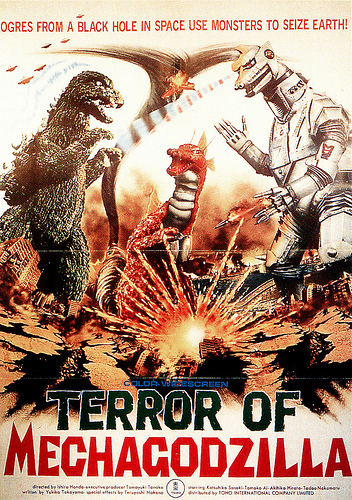 Terror of Mechagodzilla was a childhood favorite of mine, and to this day I love Hirata’s performance as a doctor who slowly realizes his hatred of humanity isn’t quite as strong as he thought it was-especially as he sees his daughter lose hers as a direct result of his actions. If possible, find the Japanese cut, as the American cut mangles the ending in a misguided attempt to make the story more kid friendly, leading you to miss a key reason for one character’s extreme action. This entry was posted in Aliens, Dinosaurs, Drama, Event Film, Kaiju, Melodrama, Movie of the Day, Robots, Sci-Fi, Sequel, Tragedy, War with Aliens and tagged "I can't love you, "sound defeats the monster", Akihiko Hirata, Akira Ifukube, aliens from a dying world, Bad Dubbing, black hole, cuts in U.S. version, cyborg, daughter, dinosaurs, disgraced scientist, father, father-daughter relationship, femme fatale, Godzilla, Godzilla noir, gojira, Goro Mutsumi, Henry G. Saperstein, I'm a cyborg", Interpol, Ishiro Honda, Japan, JDF, Kenji Sahara, mad scientist, Mechagodzilla, prison, prison break, prisoner, scientists, silver space man jumpsuit, sonar, sonic weapon, submarine, suicide, superhero Godzilla, Toho, Tomoyuki Tanaka.